Cuidado de Niños: Ayuda a cuidar niños. Artes: Pintura profesional, escultura o dibujo. Enseñar Deportes: Enseña o ayuda a huéspedes o comunidades a practicar un deporte nuevo. Enseñar Idiomas: Da clases de idiomas a huéspedes o comunidades locales. Habitación privada: Tendrás una cama en un cuarto privado. Sí, un cuarto solo para ti. Desayuno: Tienes derecho a desayunos gratis cada día de tu estadía. Almuerzo: Tienes derecho a almuerzos gratis cada día de tu estadía. Cena: Tienes derecho a cenas gratis cada día de tu estadía. Tragos gratis: Obtén tragos y comidas gratis. 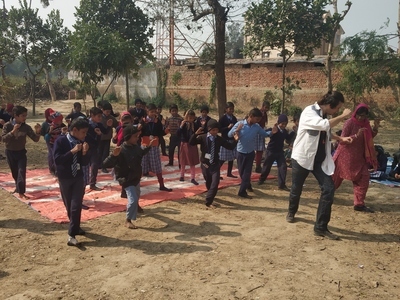 There are around 400 kids in our school.we would like you to connect with them in any sort of way be it by drawing, painting,sports, teaching English or anything. the infrastructure of school is not good(most of the kids are underprivilegd hence many parents dont pay the monthly fee at time,many of them dont even pay the monthly tuition fee which is 400rs=5$ for a month) .you can easily help even if English is your second or third language.if you have any other ideas to improve the infrastructure of school,we would love to hear those ideas. There is no obligation to work.if you don't feel like working someday,you can just relax. In June,we are planning to organise a painting camp/exhibition sorta thing for kids.so if you are a painter/artist we would love to have you at our school in June. We would want you to teach kids for 3 hours from 8:30 to 11:30 am. We don't have any rules. Just don't smoke Infront of kids 🤗 and try to wear very decent clothes since it's a small place and people are not very open minded.